Patsy Bradley's return could be a major boost for Slaughtneil as the season reaches its business end. Bellaghy have always found Ballinderry Shamrocks a hard team to overcome and that will be no different when they take on the Shamrocks at home on Sunday. It is quite a few years since Bellaghy got a league victory over Ballinderry but they look to have quite a good chance of ending that bad run at Sean de Brun Park on Sunday. The Tones suffered a 3-09 to 2-10 midweek defeat at Swatrag. Ballinderry do not seem to be putting a lot of store into the league and just seem to be ticking along giving fringe players game time and building for the championship. Bellaghy have looked a much improved team on last year with speed and team play their main weapon plus the finishing of Eoghan Brown. Ballinderry still have a core of experienced men like Kevin McGuckin, Enda Muldoon, Raymond Wilkinson and James Conway to steer them along. They never like losing to Bellaghy and on this occasion manager Martin McKindless is likely to field his strongest fifteen. It is not known whether the America bound Ryan Bell will be available and if he is it will be a big boost for the Shamrocks. Ballinderry look to have the edge in attack through Colin Devlin and Daniel McKinless and that could swing the decision in their favour. Banagher face their second away trip in three days when they take on form team Slaughtneil at Emmet Park. Slaughtneil had been hit and miss for the opening four or five games of the league and then they really clicked tallying up no less than 0-57 in their last three games against decent opposition. Mark Lynch has been struggling a bit with injuries and that my go a long way to explaining Banagher’s poor form to date. Manager Paddy Downey has been bringing in some younger players to the team but they will take time to make the necessary impact. Shane Farren should be back in the attack and that will give them a lift. Slaughtneil have formed a new midfield with Patsy Bradley and Paudie McGuigan still out injured but it is believed that Bradley after a foot operation is raring to go again and that is bad news for the opposition. The slick Slaughtneil attack featuring Shane McGuigan, Paul Bradley and ‘Sammy’ Bradley should have too much for the Banagher defence. These teams clash in the first round of the championship in six weeks time so there is likely to be a bit of ‘cat and mouse’ by the managers. Ballinascreen are on a good run and currently sit in second place two points behind Magherafelt. They are unlikely to have key defender Dermot McBride back after injury, his county colleague from Coleraine Sean Leo McGoldrick also set to miss the remainder of the league with injury. He has played little football this year and that has been a set back for his club and county. In their last home game Coleraine blew Dungiven away with an all-out attacking policy to win by 2-19 to 1-10. At half time they were twelve points in front. Ballinascreen won away to Newbridge in the last round with a strong second half performance. This could be a cagey and very defensive game with no secret weapons unveiled and there is unlikely to be much between them at the end. Coleraine will hope to hold sway at midfield through Colm and Liam McGoldrick. Ballinascreen have young Barry Grant as their find of the season so far and if he gets enough of the ball it could turn the decision in their favour. Had this game been played a month ago Kilrea would have been hot favourites, while they have slipped back Swatragh’s form has improved and now the mantle of favouritism sits with the Davitt’s who had a win midweek over Bellaghy. In their last game Kilrea suffered a ten point defeat away to Greenlough. They did score a decent 0-15 but their defence shipped 3-16. They will have James Kielt back for this semi local derby and that should give them a lift. 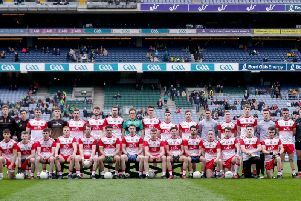 Against Greenlough the Kilrea men looked far from sharp which was in contrast to the manner in which they started the league when they looked fit and eager. The Kearney twins have been excellent for the Davitt’s with Patrick strong at midfield and Francis accurate at corner forward. Their older brother James is no slouch either. James and Charlie Kielt are strong in the middle for Paddy McNeill’s team and if they can tighten up at the back they cannot be ruled out. Swatragh are an improving team and they have the ability to get a victory. Loup seem to have recovered from a sticky spell with that good win over Swatragh and they will be hot favourites to emerge from this game with both points. They had been going well until they suffered a heavy defeat by Slaughtneil and a surprise one by Claudy but on both occasions they were short some key players. They hit 3-13 against Swatragh in a high quality game with Anthony O’Neill getting 2-5. Newbridge have a lot of tough games ahead and they need to be picking up more points if they are to get away from the lower part of the division. The result of last night’s home game with Banagher will be vital to the rest of the season as they struggle to get away from the lower reaches of the table. Loup play a nice brand of composed football and they are not short on scoring forwards with O’Neill and Declan McVey the leading lights. The experienced Aidan McAlynn is now going well at midfield. Newbridge are a spirited lot but they have not been scoring enough to win games so all form points to a Loup victory. Claudy have won their last two games against Loup and Magherafelt both by a point and that has boosted their points total to six, something they would hardly have dreamed about on their promotion. Lavey make the trip to O’Neill Park knowing that they have a stiff task against the fast and lively Mitchel’s who will be rising in confidence. Lavey are a cagey lot with their mix of youth and experience. They have big me who can field the high ball and small fast men who can cut through defences and none better than Niall Toner. The ability of James McClay and Aaron Kerrigan to rack up five or six points per game has played a big part in the Claudy revival. They have been playing recent games without a number of key players including the injured duo of Conor Johnston an excellent centre half and experienced attacker Martin Donaghy. Another win for Michael O’Kane’s men would almost certainly cement their position in senior football for a second year at least but Lavey have the experience and know how to win tight games.